Star8puppy's Animal Jam Blast: New Items! There are soo many new things!!! Hat & Beards A.K.A Santa Hats are back! Also Reindeer Masks are back!!! Also Faerie Wings came out! Giant Candy Canes are back! There's also a New Years Firework! You can buy Pest Control for your den! You can buy three lit up potted trees for your den! In the Appondale Pet Shop you can now customize your pet! Best of all horses are coming to Jamma! 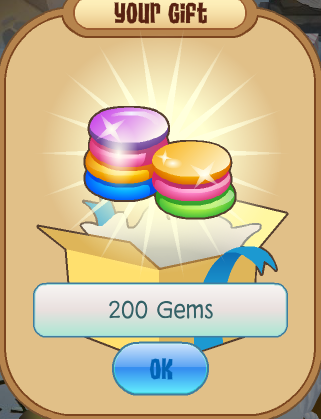 Also instead of getting gems everyday when you log into aj now you get gifts! Everyday you log in you pick a gift. Everyone gets the same gift no matter witch one you choose. First it was a Snowflake Rug, then 200 gems, and third was a Snowman Family for your den.